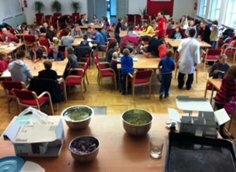 Last Sunday, November 17th, EDC employees Karolina, Maciej, Grzegorz, Marcin, Łukasz, Marek and Adrian helped the Young Explorers Club. The Tutors performed hands-on experiments for over 40 kids. The experiments answered some puzzling questions such as why some plants lose their green and from where the colour of plants comes from. Other subjects to be tackled were the chromatography of leaf colours, why onions are onions and pansies are pansies (DNA extraction !!!) and Vitamin C detection. Many thanks to our Volunteers!